It is no secret that most amateur golfers have great difficulty when it comes to hitting down and making the golf ball cover large distances on the green. That is why these DVDs precisely explain the concept of performing the swing and why it is so important. Once you have mastered the technique, you will inexplicably become a better player. When you receive tips and techniques direct from golf legends like Fred Couples and Tom White, it becomes very apparent that they receive invaluable insight on taking their game to the next level. That is why these DVDs will teach you everything you need to know to improve your skills on the green. If you feel you have reached a plateau and cannot proceed, just watch these DVDs and be amazed. A groundbreaking DVD series that brings the worlds best instructor and you together in golf s most advanced one-on-one teaching format. Filmed in High Definition, Leadbetter Interactive features cutting-edge graphics, user interactivity and high-speed photography to complement David s world-class instruction. These unique elements enhance your learning experience and help you apply David s instructional concepts to your swing. Jack Nicklaus rightly observed that fear is a golfer's greatest enemy. Nonetheless, every golfer has the capability to develop the courage required to play Fearless Golf, under even the most extreme pressure. Dr. Valiante has trained the minds of the best golfers in the world, and the results speak for themselves. Includes a wealth of simple drills....strongly recommended. Marty Schupak scores a hole-in-one! A must-have resource and a guarantee to reduce strokes. This excellent golf video is sure to put a tiger in your tank and improve your golf game. Many people take golf lessons and golf instruction for years without ever improving their golf swing. While many others spend 3 days at a Golf Schools by Golf Made Simple program and learn to hit the golf ball better than ever. For the first time ... some of these GMS exclusive drills are available for you to use at home to improve your golf swing like the over 1,000 Golfers each year that travel to see GMS. It is no secret that most amateur golfers have great difficulty when it comes to hitting down and letting the ball fly far. That is why this DVD precisely explains the concept on how to perform the swing and why it is so important. Once you have mastered the technique, you will inexplicably become a better player. 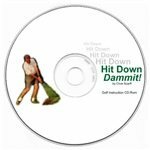 A deluxe two-disc DVD set featuring Jack Nicklaus insights and instruction broken down through playing lessons that focus on various aspects of the game and appeal to golfers of all skill levels. The footage, much of which was filmed 25 years ago in the midst of Nicklaus' record-setting career, has been digitally re-mastered, using today's unrivaled production technology, to greatly enhance the quality and appeal of these timeless golf lessons. Legendary golfer and NBC Golf Analyst Johnny Miller, author of several instruction books, now shares his knowledge and expertise in this three DVD set. Fixing Your Swing provides simple, easy-to-follow cures for common problems and is divided into chapters for easy reference. Tricks Of The Trade is focused on shot making, or how to curve the ball and control its trajectory. In Secrets of Success, he shares fine points of the game, from position of a good swing to quick tips. This 2 part DVD set will feature Phil Mickelson who will go ahead and teach you all you need to know about the secrets of putting, chipping and golfing in general. If you feel you have reached a plateau and cannot proceed, watch this dvd and be amazed. Power Golf Dynamics is a comprehensive program designed to improve golfers at all abilities. By applying the principles in PGD, you will hit longer, straighter shots more consistently than ever before. The concepts are well explained and demonstrated. The program covers all phases of the game. Understand how to get more power from your swing. This DVD series is very good and certainly will help any player of any skill level. As a low handicap, long time golfer who has for many years been interested in the physical training aspect of the swing, Roger Fredericks has been a real eye opener. A blend of unique stretches, Yoga, and breathing exercises, this program has helped loosen me up and gain 20 - 25 yards off the tee that I'd lost through inflexibility. Sean Foley- The Next Generation DVD features: 89 minutes of instruction utilizing a contemporary approach to golf fundamentals Great for golfers of every ability, handicap and interest Holistic approach to golf instruction that encourages golfers to examine their game in a practical way Drill system designed to improve your game by creating efficient power, speed, and accuracy. Get inside the minds of touring PGA pros Jim Furyk & Fred Funk as they compete in a skills match designed to help you improve your short game. Learn how to assess your own situations, analyze your options, and execute the proper shots - just like the pros do! When people receive tips direct from golf legends like Fred Couples and Tom White, it becomes very apparent that they receive invaluable insight to the tips of playing great golf from just good golf. This dvd will teach you everything you need to know to improve your skills on the green. For the first time ever, Tiger Woods opens the door to his astonishing life in golf -- from the promise of a child prodigy to the most dominant force in the history of sport. Tiger: The Authorized Dvd Collection chronicles a story of unparalleled ambition, dedication, and success woven with personal interviews and previously unseen photographs, film and video archives. Tom Watson Lessons of a Lifetime 2 - disc DVD Set is a personal lesson from one of golf's greats! Much better than lessons from your local club pro, and a WHOLE lot less! Lessons of a Lifetime is the ultimate Tom Watson learning experience: consistency, contact, alignment, rhythm, release and more, ALL covered in 2 comprehensive DVDs that are sure to deliver a series of I get it! moments. Roger Fredericks Reveals Secrets to Golf Swing Flexibility Dvd! Regardless of whether you're playing golf for the first time or are a tour pro, taking lessons or not, working on getting some of the distance back or add some that you've always wanted, even if you've never had much success with lessons, videos or any other game improvement product or golf training aid, with Roger Fredericks Golf Swing Flexibility program, you can finally do something that will help your golf game. The programs includes the Secrets to Golf Swing Flexibility, plus 2 FREE videos, Secrets to a Fundamental Golf Swing and Secrets to a Powerful Golf Swing. Also included are a wall poster, practice rope, and a take along booklet! Welcome to Leadbetter Interactive, a groundbreaking DVD series that brings the world's #1 instructor-and you- together in golf's most advanced one-on-one teaching format. Filmed in High Definition, Leadbetter Interactive features cutting-edge graphics, user interactivity and high-speed photography to complement David's world-class instruction. These unique elements enhance your learning experience and help you apply David's instructional concepts to your swing. Whether you're a low handicap or completely new to golf, your game will improve with this revolutionary program. 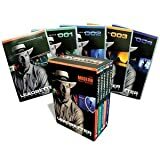 David Leadbetter Interactive 5 Disc Box Set Welcome to Leadbetter Interactive, a groundbreaking DVD series that brings the world?s #1 instructor ? and you ? together in golf?s most advanced one-on-one teaching format. Filmed in High Definition, Leadbetter Interactive features cutting-edge graphics, user interactivity and high-speed photography to complement David?s world-class instruction. These unique elements enhance your learning experience and help you apply David?s instructional concepts to your swing. Whether you?re a low handicap or completely new to golf, your game will improve with this revolutionary program. One-on-one with David Leadbetter Experience the closest thing to being on the lesson tee with David as he guides you through every aspect of the golf swing. Leadbetter Interactive features 70 game improvement drills developed by David over 30 years with the world?s top tour players. Imagine ? you and David Leadbetter working on your game, whenever and wherever you want! Analyze your swing like the pros Seeing your own golf swing helps you correct your faults simply and precisely. Leadbetter Interactive includes easy-to-use swing analysis software powered by V1 technology, the same system David uses to coach the world?s top tour players. This technology literally puts you in the lesson where David will analyze your swing, then link you to drills that will fix your faults fast. It?s like a private lesson from David right in your own home. Over 5 hours of instruction and 70 drills: Volume 1: Setup and Swing Concepts Volume 2: Golf Swing Essentials Volume 3: Shaping Your Swing Volume 4: Power = Distance Bonus 5th Disc! Swing Analysis Software (DVD-ROM) ($89 Value) Features the same advanced technology David uses to coach the world's top tour players. View and analyze your own golf swing as on screen prompts diagnose your faults and David Leadbetter prescribes drills to remedy your swing flaws. It's like a private lesson with David Leadbetter right in your own house! Leadbetter Interactive compiles over 30 years of David Leadbetter's teaching techniques, concepts and methodologies used with the biggest names in golf. Leadbetter Interactive is the most revolutionary and comprehensive instructional DVD ever! System Requirements: Operating System: Windows 2000, XP or newer Processor: Pentium 4 - 1.4 GHz or faster Memory: 256 MB RAM Monitor Resolution: 1024 x 768 Color Depth: 16-bit color or higher Disk Space: Min. - 500MB, Full - 4.5 GB free Media Drive: DVD-ROM Drive Sound: Windows-compatible Sound Card DirectX: DirectX 8.1 or newer Windows Media Player: WMP 9.0 or newer NOTE: DVDs are encoded Region Free, which are playable in any country. If you have any questions about this product or would like to order by phone, please call us Toll Free at 888-733-8383. We look forward to hearing from you! 2 DVD set by the legendary Phil Mickelson. Tips for playing like a champion. Leadbetter Interactive Five-DVD Set: Leadbetter Interactive is golfs most advanced one-on-one teaching program ever produced and includes 5 DVDs with more than 5 hours of instructional content and 70 game improving drills. The complete series was filmed in high definition and features cutting-edge graphics, hi-speed photography and model swing comparisons. Also included is the exclusive Swing Analysis software. This powerful software features the same technology David uses at his academies and with Tour pros. In each DVD, David focuses on different swing concepts and techniques and provides tailored drills to correct your swing flaws. Vol. 1 Setup and Swing Concepts: David explains the basic mechanics of a consistent, effective golf swing, and shows you how to establish the correct grip, posture, alignment, and ball position at address. Vol. 2 Golf Swing Essentials: David explains the key positions of the golf swing and shows you the proper positioning at all points of the swing to produce consistent golf shots. Vol. 3 Shaping Your Swing: Improve your accuracy as David explains common ball flights and shows you how to identify and correct the slice, hook, pull and push. Vol. 4 Power Equals Distance: David shows you how to gain valuable yards off the tee and improve your ball striking by eliminating fat/thin, sky and shank shots and teaches how to maximize your distance by demonstrating how to generate power in the golf swing. Software DVD Swing Analysis: View and analyze your swing with the same swing technology the tour players use. Developed from the V1 Pro platform, the No. 1 swing analysis system in golf. The Swing Analysis software literally puts you in the lesson where David will help you analyze your swing then link you to drills that will fix your faults fast..
For golfers of every ability, handicap, and interest, The Next Generation with Sean Foley is all about producing efficient ways to create power, speed, and accuracy with a drill system designed to improve your game. Foley provides a contemporary approach on the most fundamental aspects of the game of golf, while also focusing on unique course management techniques as well as fitness and exercise tips. Through his work with Stephen Ames, Hunter Mahan, and Sean O'Hair, all of whom are featured prominently in The Next Generation, as well as teaching Tiger Woods and Justin Rose, Foley has become the game's most sought-after coach and mentor. The Next Generation is a holistic approach to golf instruction that encourages golfers to examine, evaluate and execute their game in both a fun and practical way.